Yangon, Bagan, Mandalay, Pindaya, Kalaw & Inle Lake. On arrival in Yangon, our representative will be at the airport to meet you & transfer you to your hotel. The rest of the day is at leisure to relax. 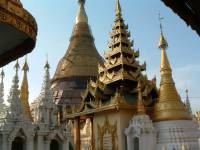 Today our city tour of Yangon will include The Sule Paya, Mahabandoola Garden and Bogyoke Market. After lunch we will take a walk through bustling Chinatown, and visit the Khant Hoke Chinese temple. We also take you on a walking tour to see many colonial buildings in town & many old Chinese houses in Chinatown district. Also a visit to the wonderful 100 years old Strand Hotel that still retains all the grandeur of yesteryear. A short walk to see the riverbank on the other side with local ferry crossing along the river. At around 4 o'clock we will visit the world famous Shwedagon Pagoda and watch the spectacular sunset & change of colour of the gold pagoda. Today's lunch at a local restaurant. 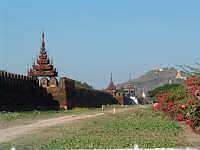 Transfer to airport for your flight to Bagan. 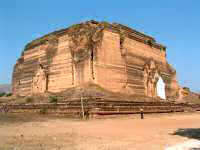 Our Bagan guide will meet you, and then we will visit Schwezigon Pagoda, a prototype of later Myanmar stupa. Then to Wetkyi-in Gubyaukkyi Temple with its fine mural paintings of Jataka scenes. Afterwards we transfer to hotel for check-in. After lunch at a local restaurant, our afternoon tour includes a visit to the lacquerware factory where you can study traditional Myanmar lacequrware making. We also visit Manuha temple with gigantic Buddha images, a captive king's impression of life in prison. 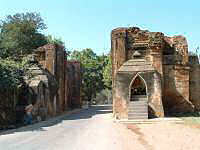 Nanpaya, an early style temple with the finest stone carvings. In the evening you will visit the Ananda Temple, an architechural masterpiece resembling a Greek Cross. Overnight in hotel. Breakfast at hotel, then full day sightseeing in Bagan including the temples & pagodas such as Pahtothamya, Mahabodhi Paya, Ngakywenadaung Paya, Dhammayangyi Pahto, Thatbyinnyu Temple, Dhamma Yangyi Temple, Schwegugyi Temple, Gawdaw Pallin Temple etc. Watch the sunset among the temples & pagodas before returning to hotel. Evening dinner will be the Nanda restaurant in a courtyard with the very popular puppet show on stage. After breakfast, we drive to Salay. On the way we visit a village where we see the toddy farmer's life - collecting toddy (the juice of the palm tree) for making liquor, making molasses & making oil. In Salay, we will visit Yoke-son Monastery decorated with wood-carvings depicting scenes for moral lessons. Then a short walk through the ruined old monastery to Laquerware Buddha image & the ancient monastery. Then we drive on to Mount Popa, an extinct volcano which is considered the abode of Nats (spirits).On top of mountain there are monasteries, pagodas & shrines all around. Lunch at a local restaurant. Drive back to Bagan in the late afternoon. Overnight at hotel. After breakfast, transfer to airport for morning flight to Mandalay. Our Mandalay guide will meet you at the airport and then drive to Mandalay, on the way visiting Mahamuni Paya, a Marble factory and a gold-leaf making works. Upon arriving Mandalay check in hotel & lunch at Green Elephant Restaurant. Our afternoon visits include Mandalay Fort, Shwenandaw Kyaung, Atumashi Kyaung, Kluthodaw Paya and Mandalay Hill for the sunset. In the morning we will take a trip to Amarapura to visit Maha Ganayon Kyaung. This enormous monastery is home to thousands of monks from the young age of 7-8 to the older generation. You will see monks reading, praying, resting, walking, working & bathing. The biggest event of the day is at 11.a.m. when the monks are gathering for lunch. This is a unique experience. Afterward we drive to the river, cross it, then take a donkey cart to Inwa, the ancient capital, to visit Yadama Semi, Bagaya Kyaung, Nanmyin, Maha Aungmye Bonzan Lunch at a local restaurant. After lunch we will visit U Bein's Bridge and Bagayu Kyaung for the 500 hundred or more Buddha images & 5000 sets of palm leaf manuscripts stored in a locked up library. After breakfast we take a cruise on the Ayeyarwaddy River (about 11km) to the ancient city of Mingun. 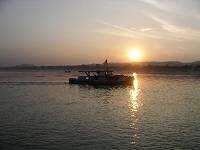 The hour-long private boat trip up river with view of river life is most pleasurable. Here we see the Mingun Bell and the enormous Mingun Paya, which you can climb to enjoy the spectacular view of the river. 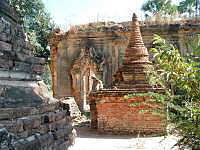 We will also visit Pondaw, Hsinbyume and Settawya Payas if you wish, before cruising back to Mandalay. Lunch at a local restaurant. 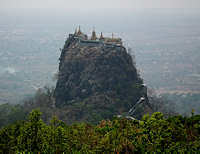 In the afternoon, drive to Sagaing Hills to visit monasteries & Soon U Ponya Shin pagoda etc. and enjoy the spectacular views. We will then visit the Khaung Mu Daw pagoda and the village of Ywataung to see the traditional silver works. Enjoy sunset from top of Sagaing Hills &return later to Mandalay. After breakfast, transfer to airport for your flight to Heho. On the way to airport we visit Snake temple & Boleik Village. The snake temple has two large Boas permanently resting on the Buddha image. The Boleik village is also fascinating with about 350 pagodas in various sizes &styles grouped together in the village area. Most of these pagodas are old, damaged & unused but it creates a forgotten wonderland hidden by the Shagn people. Arriving at Heho, pick up and drive to the beautiful lakeside town of Pindaya. Lunch at outside local restaurant. After lunch, visit Shwe-Oo-Minn limestone caves with their thousands of Buddha images. Later, sightseeing in Pindaya town and visit Pone-Ta-Lok Lake and see local ways of living. Dinner and overnight in Pindaya. Please note that this day out includes several hours hill walking: good shoes and an adequate level of fitness are required. If you feel you could not tackle this, please let us know. After breakfast, drive to the large and beautiful Inle lake. On the road stop at Aung Ban & visit this important transport junction town for cargo & passengers moving between Taunggyi, Thazi etc. Lunch in local retuarant. On arrival at Nyaung Shwe, transfer to your hotel by boat. Rest of day at leisure. Dinner at Hotel. 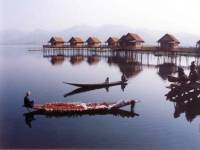 Full day sightseeing by boat on Inle lake includes Phaung Daw Oo Pagoda, Nge Phe Chaungmonastery, market, Nan Pan village, fishermens villages, floating gardens, art gallery. We will also take a trip up the foliage choked canal to Inthein, where ancient crumbling stupas lead to a covered stairway up to the Shwe Inn Thein Paya. Lunch at local restaurant and dinner at hotel. Drive back to Heho for your return flight to Yangon, pick up & transfer to hotel. Rest of day at leisure by the hotel pool or do some shopping in Yangon's markets & shops. Transfer to airport for your return or onward flight. 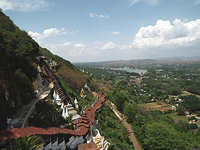 A more in-depth visit including Mount Popa, Pindaya and Inle Lake.